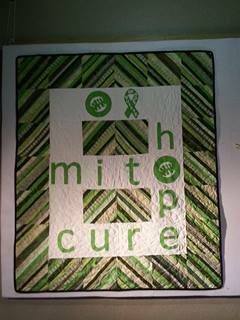 Mito Quilts of Hope Charity Quilts is a project whose goal is to give a quilt to every patient with Mitochondrial Disease (Mito) in Canada and the United States within 5 years. Due to Christine Knox’s own diagnosis of Mito, she conceived the project in August of 2013, to raise awareness of this rare genetic disease. Affecting both children and adults, Mitochondrial Disease is life threatening and has an incidence of 1:4500. Mito is an energy failure at a cellular level, which causes cells and organs die. Currently there are no treatments available, only symptom relief. Consequently with each quilt you donate, hope will be given to someone who is very ill. Even more importantly, for patients who are unable to maintain their own body temperature, quilts are a perfect gift. Especially if you belong to a quilt guild, a satellite or church group. If you quilt with friends, or wherever you quilt, WE NEED YOU! You choose the quilt design and then we’ll supply you with a patients name and shipping information. See our page Make a Quilt for quilt patterns. In addition, many patients have been waiting for up to two years for their quilt to arrive. Unfortunately, some patients have died within weeks of receiving their quilts. Most importantly, some even died prior to receiving their quilt. Finally, let’s not make them wait any longer. With your involvement, working together, we can get more quilts made! Click on the PayPal button below to donate. Donations pay for fabric, batting thread and shipping. Currently, we are not a registered charity but this is in process. Fortunately, with no paid staff, all donations go straight into making quilts for patients! Share this website with quilters you may know and ask them to help.